Decorative Life: From 4-7 plus weeks, depending on environment and cultivar. The life of individual flowers can range from 20-45 days, depending mainly on cultivar. Once flowering stops, plants can continue for months. Postharvest flower life was increased if the plants were grown under low (70%) relative humidity compared to ones grown under higher (81-93%) levels. Growing plants using 150 ppm nitrogen produced longer lasting plants after harvest than those grown using 200-300 ppm. Harvest when 10-25% of flowers are open. Member of the Crassulaceae (orpine family). Native to mostly Africa and Madagascar. Common relatives include air plant, hens-and-chickens and sedum. Flowers star-like, about 1/2 inch across, in large, loose clusters held above leaves. Leaves to 4 inches long and 3 inches across, thick and fleshy with rounded margins. One report states that this species can be shipped at 34-68F for 4-8 days with no or little loss in postharvest life. Another reports shows that just 2 days in darkness at 75F can cause leaf yellowing. Whether these observed differences are cultivar and/or temperature related is unknown. 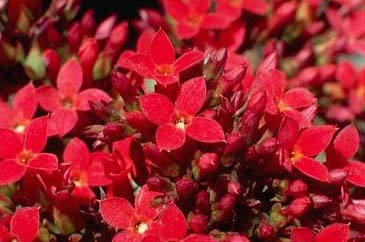 Kalanchoe adapted from Chinese name. Many members of this family are noted for their dense and compact growth. For example, Sempervivum tectorum has a common name of roof houseleek because it can be grown on roofs and acts as shingles. Another more common name for this same species is hen-and-chickens. Some favorite cultivars and their respective flower colors include ‘Majestic’ (rose/red) and ‘Revelry’ (yellow).